Burgy’s story is pretty special. She was abandoned in a backyard and was most likely used for breeding. She was surrendered to a shelter in Los Angeles. This didn’t bode well for her because the shelter was flooded with bully breeds and had to put many of them down. 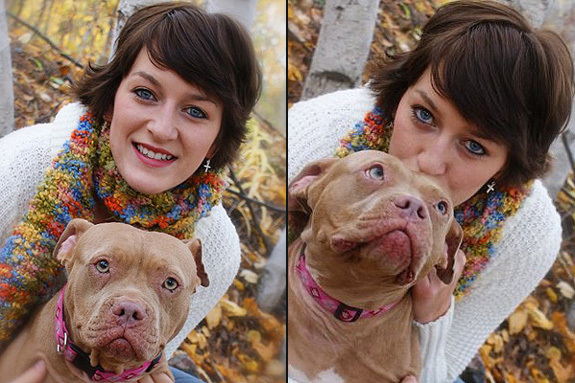 Luckily for her though, a shelter worker helped arrange her transfer to a pit bull rescue. Burgy spent six months at It’s the Pits Dog Rescue in El Cajon, Calif., which is 15 miles north of Mexico. Around this time, I had lived in California for a short time and was getting lonely. I thought I would just take a peek at Craigslist to check out the available pets. But that peek turned into a long gaze when saw the sweetest face. I contacted It’s the Pits Dog Rescue to see if she was still available. They said yes and I made an appointment to see her a week later. I was so excited when I made my way into the parking lot of the shelter, which was clean and actually beautiful. They led me to the back kennels, and there she was lying on the bottom of the metal kennel, another dog had pulled her blanket from underneath her. They let her out and she came snorting along, head down and sniffing. She had an interesting color, like a peanut, and she had pink-rimmed eyes and a little pink nose. We went to the backyard and she didn’t care at all about being outside. She just wanted to be in my lap. She started rolling on her back, using her upper body strength to whip around her lower half. Her mouth was so big, and she sounded like a gremlin with all her snorting and grunting. I fell in love with her and adopted her. Eventually, I decided to move back home to Minnesota, and although I wanted to fly Burgy, the expense was so great that I couldn’t afford it. But I wasn’t going to leave without her. So I found a way to drive home, and Burgy was on my lap the entire time. 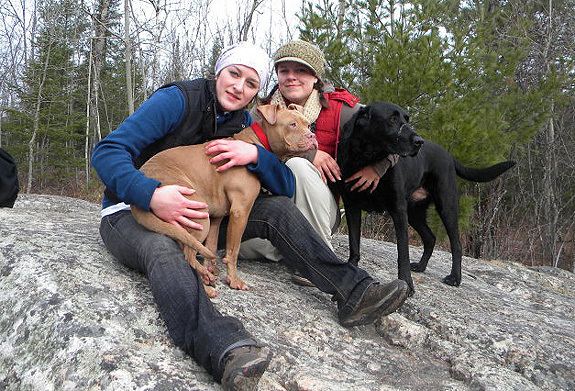 When I found her she was 15 miles north of Mexico, and she traveled up north with me to just 15 miles south of Canada. Since she’s been exposed to so many climates, she has a lot of outfits, and Burgy is so fun, she lets me dress her however I want. Burgy has been the light of my life! She has such an amazing personality. She is full of all sorts of quirks, so being with her never gets old. She rarely barks, and she’s extremely passive with people. She gets along with everyone. She just has a hard time meeting new doggy friends, but with some hard work, she warms up to them. In my opinion, it’s hard having a pit bull because of the breed restrictions. It can be tough to find a place to live. But the way I see it, Burgy is just a part of my family, so if she’s not allowed in a building we just don’t go there. I can say that regardless of all the negative opinions of the breed, this is the breed for me. She has so many characteristics that made me fall in love with her. She’s always prancing, high stepping with her feet straight out ahead of her, and smiling. She loves snuggling. She is perfectly content lying alone, but also would cuddle with me if I called her. She rides wonderfully in the car, and she usually lies down and looks up at me. Really she just stares at me all the time, and she looks to me for reassurance. She spoons like a pro. She is all about the kisses. She snorts. We wash her in the kitchen sink, so whenever I do the dishes she runs like a jackrabbit out of the room. I got her when she was 4 – 5 years old, so now she is around 8 or 9. Because of her age, sometimes I get sad just thinking about one day not having her, and I wonder if I would ever find another dog that would fulfill me like she does. Burgy is just the best! She made it with me clear across the country and is now happy in small Ely, Minn., and we’re happy together. Oh my goodness, Burgy is one of the cutest girls ever, that face is precious! Thank you for sharing her story and your love for her, what a beautiful squishy girl! @woofslc That face IS extra squishy! @skreidle We know! Too cute!!!! What a great story! 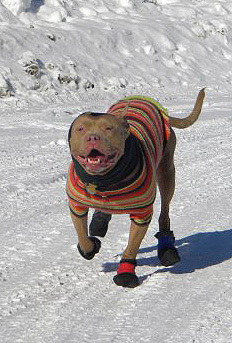 I just love the picture of her all dressed up and running in the snow. Congratulations on finding each other! 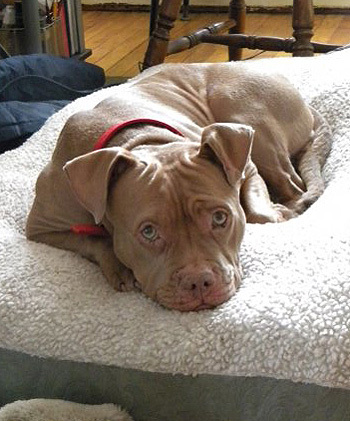 @theprettychic Thanks for helping change perceptions of pit bulls. @Pibble Thanks, Burgy loves to dress up.